During my recent trip to Hawai’i, the astro-geek in me was 1) wondering if I’d be able to see any Perseids, and 2) trying to adjust perspective, looking at the same sky from 20 degrees farther south that I was used to. What I didn’t count on was the clarity of the skies – I guess I anticipated humidity the likes of which I see at home during warm months. 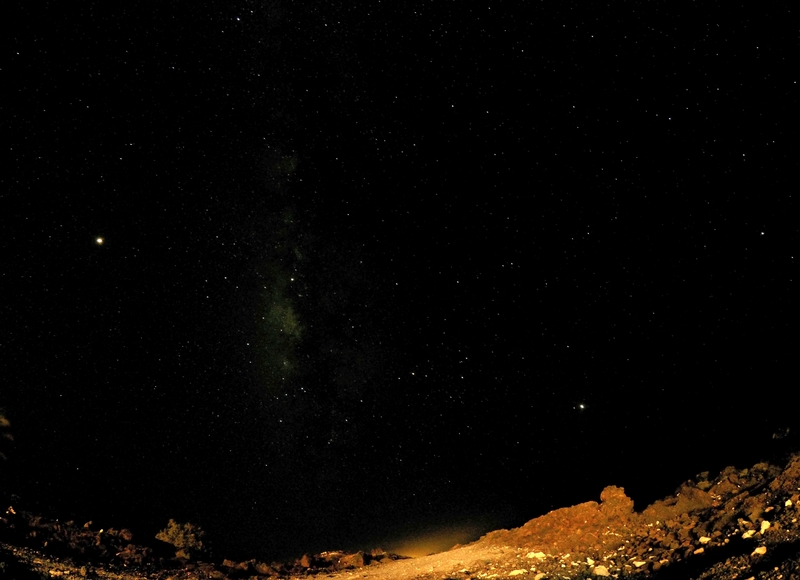 But clear skies prevailed (when Kilauea wasn’t filling the air with smoke and volcanic fog, or vog – but that’s another story), and being in the middle of the Pacific Ocean led to very little light pollution. 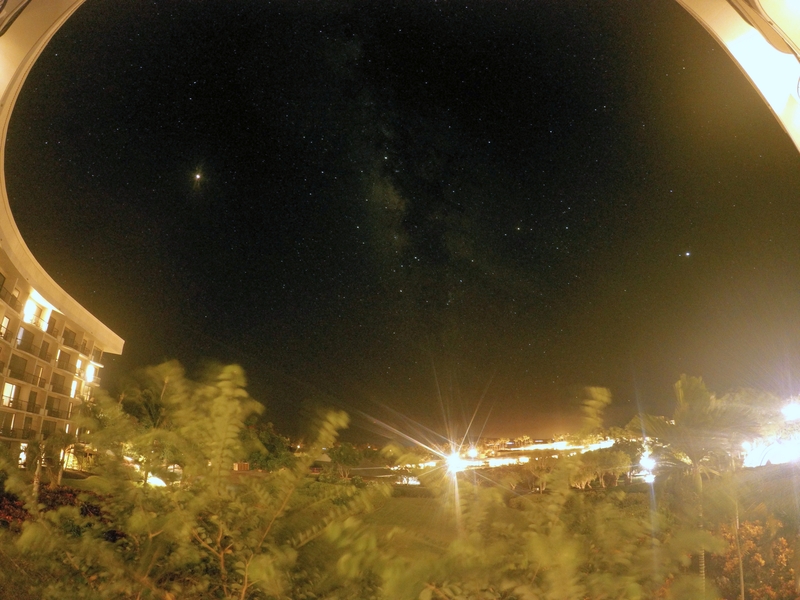 The pic below was taken from my hotel balcony – not with a nice camera or anything, but with a GoPro on night mode, 30-second exposures. 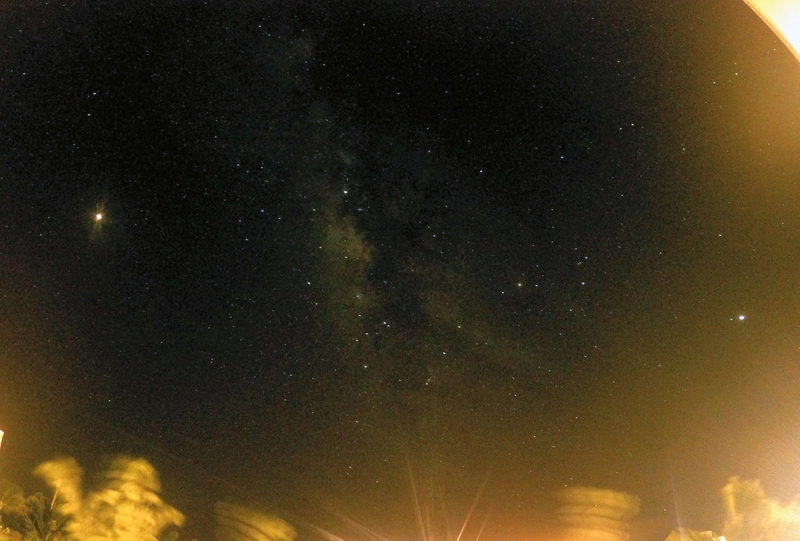 Even with all the structural lights around, the Milky Way was clearly visible. 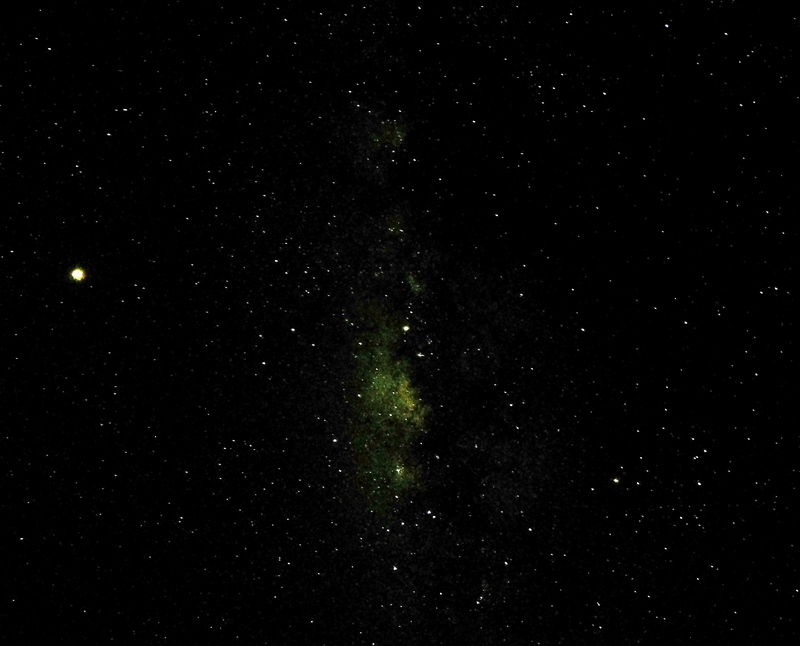 The brightest object here, just left of the Milky Way, is Mars. Saturn sits dead center, just above the teapot of Sagittarius and the galactic center. Jupiter is the bright object at right. Getting away from the lights sure made a difference. This morning I got up at 5 to look for Comet P21 Giacobini-Zinner with my 15x binocs. The sky was very transparent. I found it and gawked around at a bunch of other stuff like the Orion Nebula. One meteor flashed a howdy. I haven’t had a chance to go comet hunting yet, have had Gordon remnants on us for a few days (and prepping for Florence). 21P pretty apparent? Any tail? To the naked eye it was very faint with a subtle tail. Star chart and planning were required. I wouldn’t have found it otherwise. I hope Florence causes you no harm. Me too… Thanks. Looks like NC and southern VA will get worst of it. I wouldn’t have thought of Hawaii as a good place for astronomy, but it makes sense. If I ever go, I’ll have to bring my telescope. Lots of big observatories on Mauna Loa – you can visit as far up as about 9200 ft, summit with 4WD. We went up one day for a star party but clouds rolled info right at dusk. That’s a shame. I’ve had clouds sneak up on me a few times, and it’s so frustrating.